The 9 litre chrome water fire extinguisher is made from highly polished stainless steel and is ideal for design led or architecturally sensitive environments. As well as this it is perfect for clean rooms or hygienic environments too. 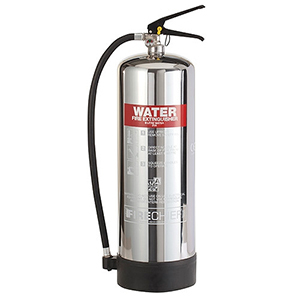 Water is one of the most useful of all available fire extinguishers, and our water extinguishers offer excellent fire suppression for attacking freely burning materials such as paper, cloth and wood (Class A). Chrome extinguishers are made to the same standard as BSEN3 kitemarked ones, but as they are not painted red they cannot display the kitemark symbol.